October 10, 2012 - New York Knicks’ radio analyst John Andariese is resigning to spend more time with his family and focus on his advertising business, ending a career with the National Basketball Association team that began in 1972. Andariese will be replaced by Brendan Brown, who was a Knicks’ radio analyst for several games last season and who has been a contributor since 2008, the team said in a news release. “After what seems like a lifetime behind the microphone and having the good fortune and privilege to be part of nearly 40 years of Knicks’ history, I’ve decided it’s time to step away to spend time with my wonderful wife, Maureen, my three beautiful daughters and my four grandchildren,” Andariese, 74, said in a statement. Andariese also will continue to focus on his role as chief executive officer of TVi Media LLC, a New York-based advertising sales company, he said. A basketball player at Fordham University from 1956 to 1960, Andariese, nicknamed “Johnny Hoops,” has been a radio voice of the Knicks since 1998. 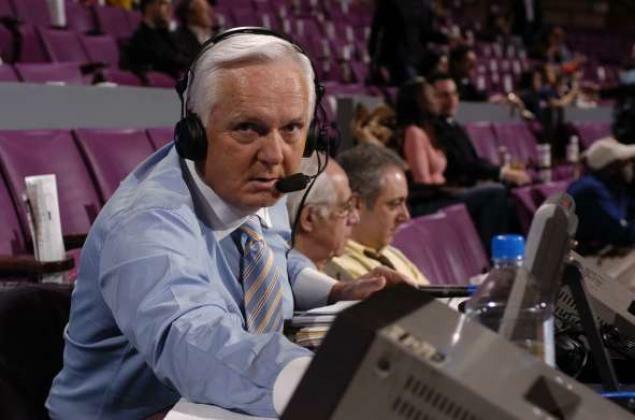 He began working on the team’s radio broadcasts in 1972 and for 12 years was a television analyst for the Knicks alongside Marv Albert, through the 1997-98 season. He was also a college basketball analyst for NBC, worked on ESPN’s “The NBA Tonight” show, and for two years was a color analyst on TBS. Andariese still will occasionally contribute to Knicks’ radio coverage, Daniel Ronayne, executive vice president and general manager of MSG Networks, said in the statement.